Guinness World Records recently declared a giant reptile known as Lolong, the largest saltwater crocodile in captivity in the world. 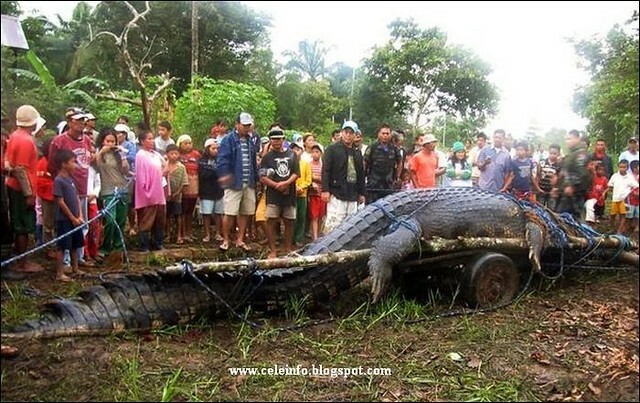 Prior to its capture in September, the crocodile was believed to have attacked and killed people in the farming town of Bunawan. The small town has a population of about 37,000. As reported by AP, the huge crocodile has brought mixed feelings of pride and fear, as well as bringing in tourism revenue and attention to the remote southern Philippines town where it was captured. While people take pride of the rich biodiversity in Bunawan, they also fear that Lolong may not be alone and bigger crocs might be lurking. Lolong has become the star attraction of a new ecotourism park and research center in the outskirts of Bunawan and has drawn thousands of tourists since news of its capture spread. Mayor Edwin C Elorde said his town has earned 3 million pesos from the modest entrance fees at the park, with most of the money being used to feed and care for the crocodile and maintain the park. The announcement by Guiness would help people realize the biodiversity of their surroundings and the need to protect it. For this reason the Environment and Natural Resources department would recommend that the government help Bunawan to become an ecotourism destination. Lolong: named after a govt environmental officer who died during the course of capturing the reptile. Record breaker: re-write previous record by Australian crocodile, 17-feet weighing nearly a tonne. Our Sarawak's Bujang Senang a contender? If you recall, there was a documented capture of a white-backed killer crocodile in Malaysia called Bujang Senang (Happy Bachelor) that has attacked and killed villagers in Sarawak town of Sri Aman. Bujang Senang measured 19.25 feet and was killed by villagers at Sungai Pelaban in Lingga Batang Lupar, Sri Aman on 20 September 1992? Google "Bujang Senang" and you will find quite a lot of interesting information about it. That's almost comparable to Lolong and is definitely larger than the one in Australia but it was not recorded by Guiness. Wow, he is huge! It must have been quite difficult to capture him. I hope he will be happy in his new home. If tourists are happy, the zoo keeper should also take very good care of the croc. Remember this is the Guiness record holder.